Foggy and growing darkly-gray this early-evening Monday on California’s north coast, cool as opposed to great heat found a couple of miles inland. 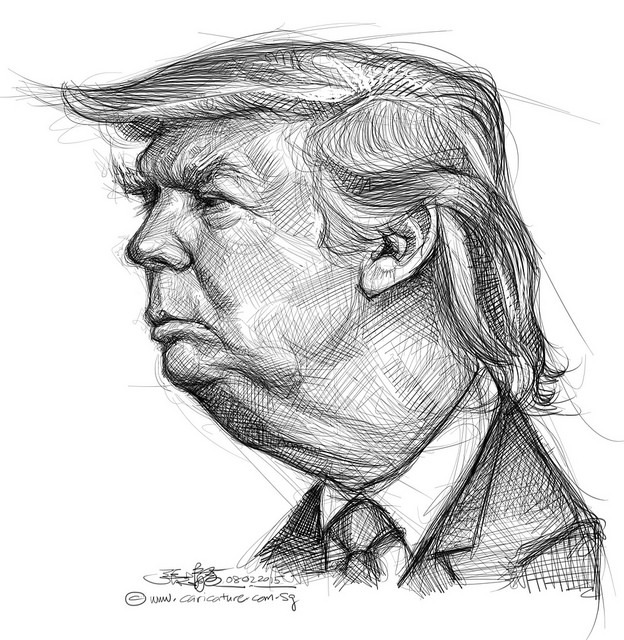 (Illustration: Donald Trump, ‘Basic Shapes,‘ by caricaturist/illustrator Chong Jit Leong, found here). Sinclair took control of the Eureka-based ABC affiliate KAEF — home of North Coast News — as well as the FOX affiliate station KBVU, CW Television Network affiliate KECA-LD and Univision affiliate KEUV-LP as part of the commission’s June 30 decision, according to Bonten. The most striking thing about the interviews, however, may be that one company was behind all of them: Sinclair Broadcast Group. The Maryland-based company is the nation’s largest owner of TV stations, with 173 in 81 cities nationwide, including those that interviewed Trump in August. The Washington bureau was Sinclair’s, too; it provided its interview with Trump to Sinclair’s many stations for their newscasts. A review of Sinclair’s reporting and internal documents shows a strong tilt toward Trump. Sinclair gave a disproportionate amount of neutral or favorable coverage to Trump during the campaign while often casting Clinton in an unfavorable light. But President Trump, historians and consultants in both political parties agree, appears to have taken what the writer Hannah Arendt once called “the conflict between truth and politics” to an entirely new level. From his days peddling the false notion that former President Barack Obama was born in Kenya, to his inflated claims about how many people attended his inaugural, to his description just last week of receiving two phone calls — one from the president of Mexico and another from the head of the Boy Scouts — that never happened, Mr. Trump is trafficking in hyperbole, distortion and fabrication on practically a daily basis. That leaves scholars like Ms. Goodwin to wonder whether Mr. Trump, in elevating the art of political fabrication, has forever changed what Americans are willing to tolerate from their leaders. “What’s different today and what’s scarier today is these lies are pointed out, and there’s evidence that they’re wrong,” she said.